Whatcha got planned for Father’s Day this year? It’s coming up. Like, coming up fast. And I gotta say I’m feeling thankful I’ve got friends who are on the ball and already planning a family camping weekend up in the mountains that I can tag along on. Father’s Day camping weekends are the stuff of legends. It’s a mythical adventure. One that evokes images of flannel sporting, pipe smoking, canoe paddling fathers teaching their kids the ways of the wild out of their wood-paneled Wagoneer. Of course, we all know family camping is not such an organized endeavor. The reality is as soon as your kids are released in the wild, they become feral animals like Lord of the Flies. Any visions of a calm, relaxing getaway go out the window in seconds. Now that my daughter is 7, we’ve gotten the camping thing pretty dialed in. But, it certainly wasn’t always like this. I’ve learned a lot about what it takes to have a successful family camping trip through trial and error. I was talking about it the other day my friend Shanti Hodges. She’s the founder of Hike It Baby, a non-profit that helps get families into nature with their wee ones, and an ambassador for Keen footwear. I asked what advice she and her husband have for dads wanting to introduce their kids to the wild. Here are 6 Dad Pro Tips they had to share. (See all 10 Dad Pro Tips here). Camping with kids is no fun when you’re wet and cold, without any other options. Think about what’s around your campground and if you can find reprieve from weather, be it a restaurant or some other kind of space you can get a hot meal and get dry. Video games or a football game are a bonus. When we first arrived at Sol Duc Campground I geared up Mason in a one-piece rain suit, but had trouble getting boots on him. Giving up, I set him down and started to unload. By the time I turned around with the first load of gear, he was smack dab in the middle of the fire pit already covered in large, black charcoal stains from head-to-toe. I dropped the gear and went over to make sure there wasn’t anything to nasty in the fire pit. It looked okay. He was contained, occupied, and having fun, so I just let him play with the burnt sticks. He was going to get dirty anyway and mom wasn’t around, so I just let him be while, I set up camp. The less stuff you have to mess with the better in my opinion. I try to just bring the basics. That said I always end up bringing too much stuff, especially clothes. I usually bring more clothes than I need, which isn’t a big deal when your car camping, but I always end up wearing the same stuff everyday. More is good when the weather is cold, but if you can bring less, try. I could definitely thin out my clothes packing. An article that I have found to be very helpful for thinning out my clothing is by Andrew Skurka. At first I didn’t want to bring toys and stuff like that, but Mommy insisted, which turned out to be a good call. She had forced a couple of Mason’s favorite toys at the time on me and then stacked up a few books. Book can be a great way to keep a toddler busy, but also provide familiarity when in a strange place. Pick books you often read to them. They will read the same book over numerous times, so it’s quality, not quantity in stuff you want to have with you. A toddler’s needs aren’t much different than yours. They want to be hydrated, well fed, warm, dry, and rested. Organization is key. I find it helpful to use packing cubes to keep clothes and clear storage bins that are labeled. Two brands of packing cubes we use are Eagle Creek and Deuter. I also like to use pet food containers such as the Vittles Vault which are affordable, waterproof, and varmint proof. Once you get out there on your first camp trip with your little one don’t make that a one-time occurrence. 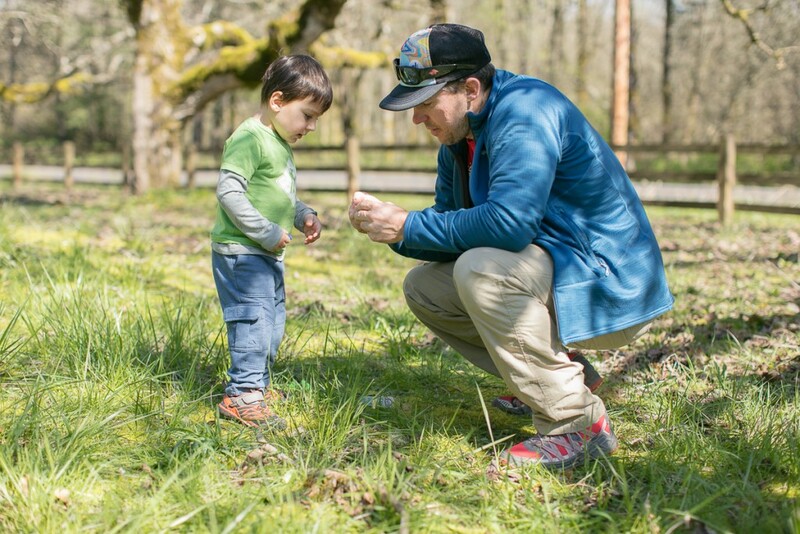 Plan some regular solo trips with your little guy or gal. Start small with something close to home if you are feeling nervous. There’s no shame in deciding it’s not going to work out if your kid wakes up screaming bloody murder and yelling for Mommy at 2am. Going home is not defeat. It’s just a “better luck next time” scenario. Remember, practice make perfect.